It kind of fascinates me how the different colors of fiber and yarn dyes (and different brands) behave. Some are easy to dissolve, and others are not. Some will completely change color over time, others don’t. My preferred dyes for fiber and yarn are Jacquard Acid Dyes but Cushings has a few colors that I absolutely love. Specifically, the more muted hues like Lavender, Red Grape and Nile Green. Jacquard’s tend to be brighter and bolder. Yellow Sun – Very quick to separate after mixing. Can be strained and used indefinitely, but the color will not be as strong over time. Aztec Gold – Love! Nice and deep when freshly mixed, tends to glob with age requiring straining. Burnt Orange – Looks like an icky brown when applied so I always think I have to mix a new batch. However, once heated it turns orange. Crimson – Pretty straight forward dye but needs to be strained unless freshly mixed. Salmon – Personally, I’m not a fan. Sort of a weird, ugly underwear color. Royal Blue – This one is different from the others. The dye itself is very grainy as opposed to powdery. Not as easy to dissolve and tends to be more speckled and uneven than solid. Sapphire Blue – More consistent and brighter than Royal. Emerald – Gets very gloppy with age. Can be strained and re-used but the color won’t be as strong. Spruce – Starts off blue-green but as the dye sits, it separates and becomes mostly blue. Brown – I have a hard time getting consistent, solid coverage with Brown. It tends to leave dark and light areas. Tan – This is a Cushing dye. Love the color but the dye is grainy and harder to dissolve than others, specifically the blue particles. Those will sometimes show up in your finished product. By the way, the other Cushing dyes I’ve used dissolve just fine. Don’t want to pick on Cushings! Which dyes are your favorites? Thanks for the description of the dyes. Very helpful. 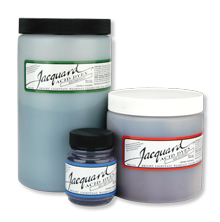 Just my luck — I was restocking acid dyes and, out of three choices for red, I grabbed a small bottle of Jacquard Crimson. As I’m not a fan of straining dye, I guess this is one not to have sitting around on the shelf for years! Honestly, all the reds do that to some degree…. most colors do. So go for it!